Write on with a pen. Cut or tear to open. From and To write on area. Peel off sealer strip and press flap to close. The bags are numbered on the bag and on the tear-off receipt tab. Sequential Numbers. 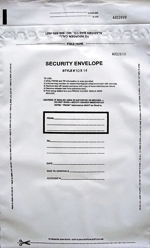 Bags are printed in black ink, with a special ink absorption treatment on all writing areas. Customized Poly Bags: Please inquire. Clear/No Print 10" x 14"
Other Sizes include 9" x 12" - 15" x 20"